European trade unions are among the most influential and powerful institutions within Western economies, in many cases cooperating with the government and employers' associations in socio-economic decision-making processes. Consequently they also play an important role in the formulation of policies relating to immigration and the migrant workers, who are arriving and becoming part of the workforce the unions are representing and protecting against employers and other authorities. However, trade unions have not always fulfilled their role as the most obvious organization to defend the interests of foreign workers to the extent they could be expected. The reasons for this are complex and due to conflicts of interests that arise from their intermediary position between employers, government authorities, and indigenous workers. 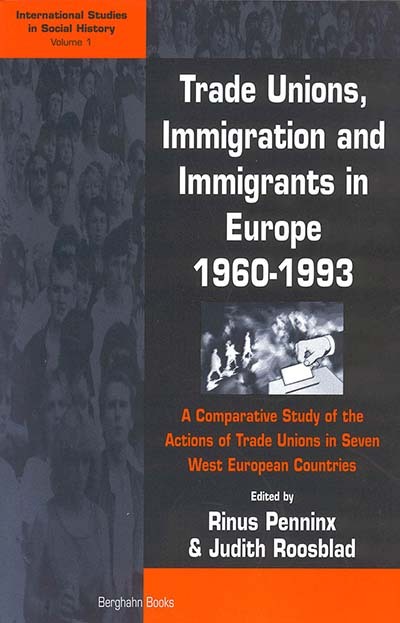 This volume offers a rich analysis of the situation in seven major European countries but also a comparison of the data found and an attempt to account for the differences established. It ends with some conclusions on the prospects of trade unions within the European Union, and on the lessons to be learned from the present analysis. Rinus Penninx holds a Chair in Ethnic Studies and is the Director of the Institute for Migration and Ethnic Studies at the Free University of Amsterdam. Judith Roosblad also works at the Institute for Migration and Ethnic Studies and is writing a dissertation on "Trade Unions, Immigration, and Immigrants in the Netherlands," at the Free University of Amsterdam.